When I arrived at Hunting Island State Park I was treated most kindly by old friend, Ranger Michael Ray. Michael is a South Carolina Park Ranger I met last year at Edisto Beach. He is a neat guy, always ready to lend a helping hand. South Carolina Park Rangers, like Rangers all over America, have jobs that young folks and adults envy and often aim for during their education. These envious people do not, however, recognize the “disadvantages” of the occupation such as keeping visitors on the straight and narrow and the constant drudgery of maintaining facilities on very limited budgets. The early spring beach at Hunting Island State Park has many stories to tell. Can you spot the lighthouse. After our brief visit, I took a walk on the great flat beach. The bright, sunny early spring day was refreshing and turned up all sorts of interesting sensory stimulating phenomena: the intoxicating smell of salt air; palm trees casting waving shadows like seductive beach dancers; foraging sea birds like the curlew and inimitable brown pelicans swooping, then crashing headlong into the lagoon catching mouthfuls of fish; beautiful swamp grasses, such as cabbage palmetto that seasonally changes color from green to green and white, resembling a Indian chief head dress. Miss Minna, my little dog, sitting then trying to walk, limped to me on three paws with a beach thorn caught in the hair of her right front paw. She is a courageous little hiking companion. We came upon a fallen palm trunk that formed a bridge that I stepped over and she snuck under. Here, I looked down to find the odd shaped sand sculpture pictured above, a delicate artifact lying on the moist sand, three inches in diameter and fragile as a sand castle. Down on one knee I examined and photographed it. The mere act of picking it up, to examine it more closely, found it crumbling in my hand. After some research, and with the help of Hunting Island friend Jonathan Greene, I learned that this is a layer of the egg casing of a MOON SNAIL. Visitors admire the beauty of this strange animal, but to clams and other mollusks it is a predator to be avoided as they plow through the sand. 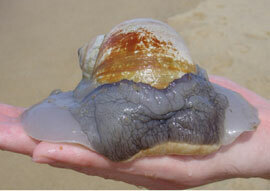 Moon Snails glide on voluminous, mucus covered body part called a foot. If you were snail size, these little fellows would, no doubt,make a science fiction movie out of your life. When these snails encounter a clam, they envelope it in their fleshy foot, and use a mouth part called a radula to drill a hole and eat their prey. You may have picked up clam shells neatly drilled as if someone were to bring an electric drill to the beach to make these holes. Moon Snail hole drilled in a mollusk. But the Moon Snail is the carpenter who utilizes a built-in tool to create a beveled hole as an entrance to secure a meal. The radula is like a tongue with teeth that rasps until a hole is made. A chemical is secreted to help soften the hard shell, and the process is slow and methodical. If you look in shallow waters at low tide, you may see one of these snails. Pick it up to see if it is in the process of drilling another animal. Moon Snails are not discriminating, and will even drill another Moon Snail if it is encountered. Bountiful information about Moon Snails is available online so I won’t include all of the facts here. But know this: discovering such a fragile specimen as the snail’s egg casing is one of the great wonders of traveling. The opportunity of seeing life as it evolves in human and other earth species is nothing short of miraculous to this author. Hunting Island Light reflected in a window. Hunting Island Light at mid-day. Hunting Island State Park is also home to a handsome lighthouse which happens to be the only walk-up lighthouse in South Carolina. Not to be missed for $2.50 a person. Built in 1875 and engineered to be movable, was moved to this location 14 years after it was constructed. Its light 140 ft above sea level visable seventeen miles out to sea. I am so grateful to come home to your newest adventure. As with the poem from January, you make it so clear that it’s in the smallest, the least and the simplest of things that true meaning is most readily discovered and understood. An opportunity for growth is sure to follow. My prayers are always with you, for you lead the way along a road that is, sadly (by my thinking), less traveled. As you know the road less traveled has a bump or two in it. The simple things have their price. Though I hope to be telling this somewhere ages hence…. I think more likely I better tell it now because the ages hence are here.